Shani resides in his own idol. Saniswaran was very upset for he was being held responsible for all the woes of human beings. He prayed to Agneeswarar, Lord Siva at Thirukollikaadu after bathing in the Agni theertham. Lord Siva gave him darshan & praised him for being a just planet, meting out justice impartially based on the deeds of human beings. He further pleased Saneeswara by asking him to reside in the temple as Pongu Sani, showering his blessings on devotees. Presiding deities are Agneeswarar or Thirukollikadar, a slightly reddish lingam and Mirudupaadanayagi or Menthiruvadiamman or Panjinmelladiaal. (mirudu or men means soft in Tamil. Panju – cotton, Paadam is foot. i.e., goddess with feet as soft as cotton). Thirugnana Sambandar has sung the praise of Agneeswarar. Agni Bhagavan is said to have worhsipped lord Siva here and hence the name Agneeswarar and the place came to be known as Agnipuri. Thirugnana Sambandar called the Lord Kollikaadar in his pure Tamil (agni, kolli-fire). This ancient temple was built as a granite structure by the Chola kings. Inscriptions of Raja Raja Chola, Rajendra Chola and Rajadiraja Chola I are to be seen in the temple. There is no Raja gopuram. Nalan who was rid of his Sani dosham at Tirunallaru, is said to have got back his wife, children, kingdom and all wealth after worshipping at this sthalam. A Chola king with heavy Sani dosham finally got relief from his sufferings on worshipping the Sani Bhagavan at Kollikaadu. King Harichandra is also said to have bathed at this sthalam and was finally relieved of his dohsam by the grace of Kollikadu Sani Bhagavan. The river where he bathed is still named after him. The sannadhi for Sani Bhagavan is in the South west corner. 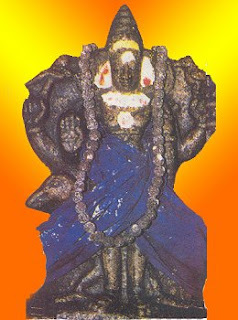 The idol is seen with kalappai or plough (right) & crow (left) in his upper two arms, left hand by his side as ooru hastam and the right hand as abhaya hastam (Anugraha murti). Offer of Oomatham flower to Lord Sani here is said to cure mentally afflicted devotees. On performing pooja with Vanni leaf he will shower wealth and on offering Kondrai flower he will bless devotees with peace & unity in the family. There are sannadhis in the main praharam for Murugar with Valli Deivayanai, Mahalakshmi, Saniswaran, Bairavar, navagrahams. The navagrahams are positioned differently here in an open formation all facing the Lord (|_|). Lord Muruga is seen with a bow and arrow instead of his vel. In niches on the outer wall are idols of Vinayagar, Dakshinamurthy, Lingodbavar, Brahma, Durgai. The sthala vriksham is Vanni. Saturn one of the nine planets in the navagrahas proceeded to Agni Vanam -Thirukollikadu and did severe penance so that celestials and human beings will worship him. Happy with the penance, Agneeswarar appeared before him in the form of Agni and blessed him. Thus Saturn took another incarnation as Pongu Sani with a plough and a flag with crow embossed on the flag. He is consecrated in a separate shrine. Bhairavar Saturn’s guru is also installed in front of Saturn. Saturn is called Pongu Sani and Mangala Sani as he blesses the devotees abundantly. Navagrahas face one another which is unique in this temple. Saturn holds a plough and abhaya hastham in his right hand and a crow in his upper left hand and Uru hastham in his lower left hand. He is seated on his vahana crow majestically and is attired in a dark blue outfit. People suffering from the malefic effects of Sani- seven and a half years -ezharai nattu Sani will surely benefit worshipping him here. Only on Saturdays, the temple remains open even in the afternoon. From Tiruvarur: to Vikkirapandiyam. (20 K.M.). Bus NO: 28. Timings: 05:30 A.M, 08:00 A.M, 11:00 A.M, 02:00 P.M, 5.00 P.M.
getdown at Vikkirapandiyam (The Last Bus Stop). Temple is located at 2.5 k.m. distance and you will get Taxi or Auto. From Tiruvarur: to Thiruthuraipoondi. (12K.M.). getdown at Katchanam 4 Road Bus Stop. Temple is located at 7 K.M. distance. You will get Taxi or Auto. From Mannargudi to Vikkirapandiyam. (18 K.M.). From Mannargudi to Thiruthuraipoondi. (15 K.M.). Getdown at KOTTUR Police Station Bus stop. The Temple is located at 7K.M. distance. Taxis are available at any time. From Thiruthuraipoondi To Vikkirapandiyam. (18 K.M.). Mini Buses are available at every ONE HOUR. The given below is the address of the Gurukkal, and if you have any clarifications with Pooja, please make a call and he will suggest you.